No one knew for certain if Wet Hot American Summer could pull off its prequel reunion series on Netflix, but by the full trailer, the First Day of Camp looks like everything we’ve dreamed. See the star-studded cast reunited (and joined by some other ridiculously famous folk) for our first official trailer, along with a slick new poster! In addition to the glorious new trailer (only slightly greater than that VHS retro version), Netflix debuted the series’ gorgeous full poster, throwing back to the original one-sheet. Acting as a prequel to the 2001 cult classic, First Day of Camp returns the expansive cast of Ant-Man star Paul Rudd, Guardians of the Galaxy voice Bradley Cooper, Parks and Recreation lead Amy Poehler, The Hunger Games player Elizabeth Banks, Marry Me star Ken Marino, Law and Order: SVU legend Christopher Meloni, Janeane Garofalo, SNL alum Molly Shannon, Frasier star David Hyde Pierce, Brooklyn Nine-Nine star Joe Lo Truglio, Michael Ian Black, 30 Rock supporting player Judah Friedlander, Zak Orth, and Marguerite Moreau, and Michael Showalter. New recruits to Camp Firewood include Michael Cera, Weird Al, Kristen Wiig, Chris Pine, Jon Hamm, Jason Schwartzman, John Slattery, In A World star Lake Bell, The Interview breakout Randall Park, Glee star Jayma Mays, Michaela Watkins, Rob Huebel, The Good Wife star Josh Charles, Richard Schiff, Paul Scheer and director David Wain himself. The 8-episode series will act as a prequel to the original (despite actors being 14 years older), taking place on the First Day of Camp, as opposed to the 2001 film’s last. Wain and Showalter will also write and direct the new 8-episode follow-up, all episodes going online July 31. 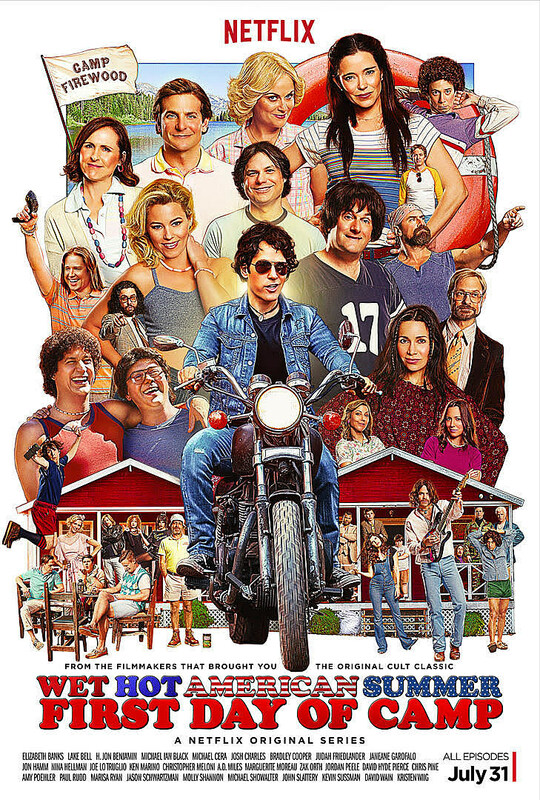 Return to Camp Firewood by the above and below teasers, and count down the days to Wet Hot American Summer: First Day of Camp on July 31. Check Out More ‘Wet Hot American Summer’ Photos!